Would you believe I am writing just after the third anniversary of Frusher on Food? If you had asked me three years ago I wouldn’t have thought it would be still going, let alone with views approaching 150,000! I also wouldn’t have believed that I would have reviewed 100 of Nottingham’s restaurants and missed Turtle Bay. Over my three years this Caribbean restaurant has established itself as one of the most successful restaurants in the city. It is more than just a purveyor of food certainly, its happy hour rum-based cocktails means the bar area is often packed too. The menu has lots of things from the grill, mostly with jerk marinate as well as some Caribbean curries, the browned chicken my favourite of those. On this occasion I popped in for a quick lunch and went for a Street Burger from the “Lunch n Lighter” section. The jerk pulled pork that topped the meat was used sparingly but had a good warmth from the spices. The burger itself was equally enjoyable, well cooked, though a sweet brioche bun often divides opinion it worked well with the spice. It came with fries and slaw that were both contributing effectively to the meal, the slaw crunchy and fresh and not an afterthought like it often can be. One of the most enjoyable additions was Aunt May’s Bajan Sauce which was a firey yellow number that adorns every table. Having discovered you can now get it Tesco I am likely to invest in a bottle. 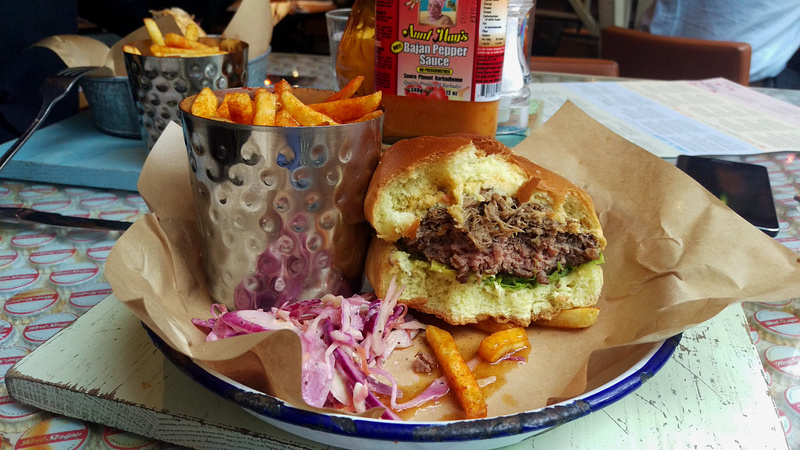 The advantage Turtle Bay has is that there is little competition for this sort of cuisine in Nottingham. That and it’s 2-4-1 cocktails ensure the popularity of this restaurant will endure the months and years to come. It might be rude to call it Nando’s with rum but I feel that isn’t far from the truth. Both the lighter items and other dishes fair reasonably on cost, the burger coming in at £8.50 which when the city’s competition for a posh burger is £10-15 on average seems alright to me. For me it’s not a place for an occasion but if you are lacking inspiration and around Nottingham you could do a lot worse.